James Zwerg was born in Appleton, Wisconsin in 1939 and attended Beloit College. He developed an interest in civil rights from his relationship with his African American roommate, Robert Carter who was from Alabama. Zwerg witnessed the racist treatment of his roommate and it deeply moved him. Zwerg participated in student exchange program at Fisk University a predominately black university in Tennessee. 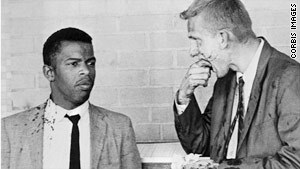 There Zwerg met civil rights leader, John Lewis and began to become active in the Student Non-Violent Coordinating Committee (SNCC). 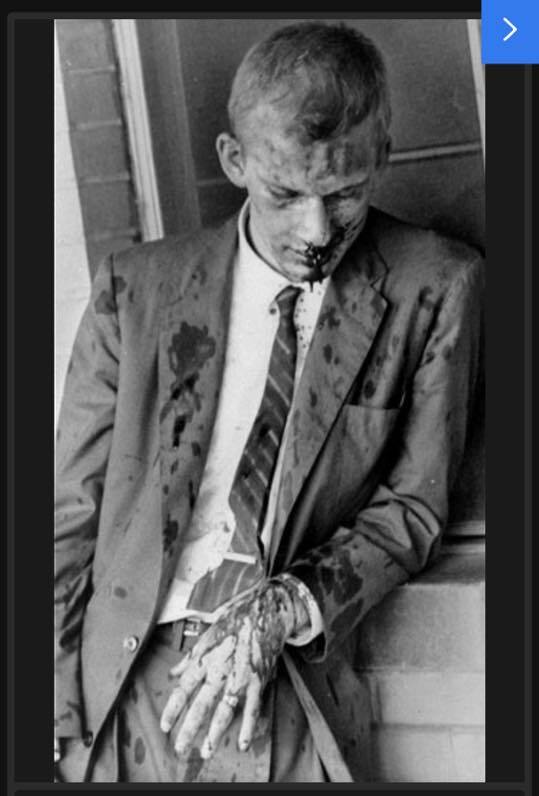 Zwerg tried to attend a movie at a segregated theater with other black SNCC members and was attacked, being hit in the head with a monkey wrench and knocked unconscious. In 1961, Zwerg and other SNCC members participated in the “Freedom Rides” which were bus trips into parts of the south that were used to protest segregation. Zwerg was the only white male in his group and volunteered to get off the bus first when it reached Montgomery, AL.. When Zwerg stepped off the bus, his suitcase was grabbed and smashed into his face until he hit the ground. He was then beaten repeatedly. His teeth were knocked out during the beating and his attackers showed no signs of stopping. A black man stepped in and ultimately saved his life yelling at Zwerg’s attackers to beat him instead; which they eagerly did. Zwerg was denied prompt medical attention because there were no white ambulances available. He remained unconscious for two days and stayed in the hospital for five days. His post-riot photos were published in many newspapers and magazines across the country. Much of his time in the hospital he claims not to remember. 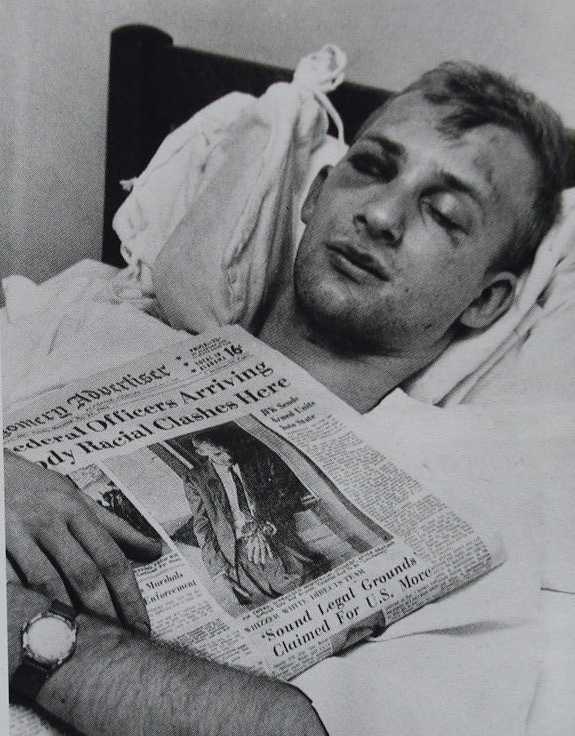 James Zwerg in the hospital after being beaten. He was unconscious for two days and stayed in the hospital for 5 days. James Zwerg was presented with the Freedom Award by Dr. Martin Luther King, Jr. and the Southern Christian Leadership Conference in 1961. Was Zwerg struggling with grasping the impact of “white privilege” even before it had a name? Though his efforts were heroic he wondered if the notoriety and attention he received was due largely in part to him being white. Blackmail Friends, what do you think? Click the link below to read a CNN article about James Zwerg and his experience.